You know when you discover something insanely cool and you get so caught up in the dream of it that you kind of apply it to all matter in the universe, rather than just apply it to rather extreme and unstable conditions? I guess I’m very human centered and went oh it exists? It seemed natural that it should exist in my body! Seeing one thing and applying it to everything seems to be a common human trait (see my hammer, it is cool I can hit everything). I guess this is why scientists are often fairly cautious folks and why science fiction writers often get it wrong, even when they put in a whole lot of homework! Caught up in the coolness of a fact was kind of what happened to me as I was studying particle physics! 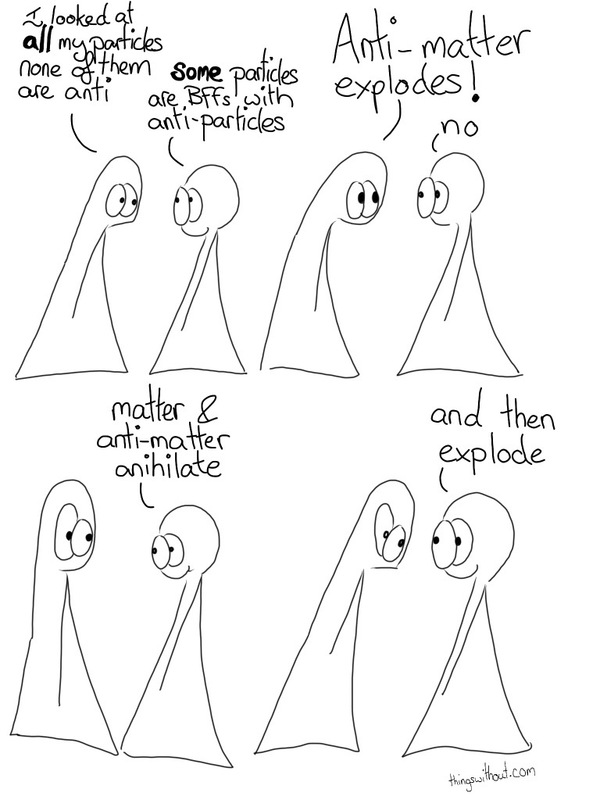 I mean, maybe the Things are amazing enough to contain anti-particles inside their frames, but maybe not. Anyhow, anti-particles and particles do hang out together in these crazy, intense relationships, BUT my new impression is that these are intense gamma radiation inducing relationships that don’t last so long. I’m really glad folks corrected me, because otherwise my understanding of stuff would have been skewed for who knows how long and yours too! It’s really nice being able to have physics conversations with people who know so much. Love it! The history of particle physics is littered with mistakes, confusions and dead ends. The way to truth and understanding is often convoluted! Thanks! I love learning through mistakes and conversations. It turns discovery into an interesting journey rather than just received wisdom. I got a moment of anxiety that I might be abusing good scientists time and accidentally tricking people!